Did you know that my friend (and Feb EIC guest designer) Courtney Baker has her own stamp company? It's called Practicing Creativity. She currently has two stamp sets that you can purchase directly from her blog, click HERE. I wanted to tell you a little bit about these stamps. Ok, so these stamps are awesome! They are clear photopolymer which is about a million times than acrylic. These are FABULOUS! Forget anything I've said in the past about other brands, these ones are the BEST! I didn't have to prime them. I didn't have to use special ink. I didn't have to stamp on a mousepad. The images are crystal clear. Did you see how many times I stamped the dandelion yesterday? It was so easy! I used the You're Dandy set. You also saw a card using this same set yesterday on my EIC post. 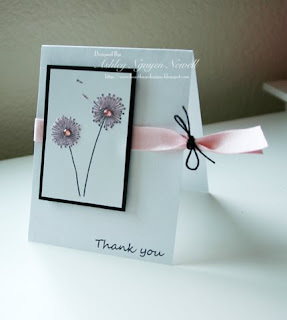 For this card, I used the two dandelions, the little pieces coming off the dandelion, and the Thank You sentiment. The ribbon is May Arts. The twine is SU. On the dandelions and the fluff, I used the Sakura Quickie Glue Pen and some Sparkly Fluff. You'll see lots more Practicing Creativity creations from me. Now, it's really important that you know that Court NEVER asked me to write this. She and I are friends but I would not steer you wrong. Court is as sweet as sugar and as talented as they come. Check out her BLOG. This is one fabulous card. I just love the colors. I just love both of Courtney's stamp set. Right now I'm on a shopping FREEZE! :) But when I can it's on my list to get. I too really really love this set, and agree completely with how they stamp etc. Really like the CAS card here, and your one below for the EIC is awesome! I've used this set so many times already, and can think of tons more ways to use it. Although, the circle of dandelions is so cool, I would never have though of that!